Whether you’ve just had a root canal performed or you needed to restore a cracked tooth, dental crowns in Sunnyvale truly get the job done. Of course, before they can start protecting your smile for years to come, the dentist needs to have it fabricated. Since this process can take as long as two weeks to complete, you’ll need to wear a temporary crown to protect your tooth in the meantime. This causes many patients to ask questions: “How do I maintain it?” “What can I eat?” “What if I have a dental emergency?” We’ll answer those questions today. How Do I Maintain My Temporary Crown? In order for temporary crowns to stay in place, but still be easy to remove later, the dentist uses temporary dental cement. Temporary crowns are also created in universal size and shape, but permanent crowns are designed to blend in with your smile exactly. After you have the temporary crown placed, you’ll want to keep a few tips in mind. First, make sure that you avoid chewing any food on the side of your mouth where the temporary is until the local anesthesia has worn off. You don’t want to accidentally unseat the temporary crown because you can’t feel the gum tissue around it. Keep in mind that mild sensitivity to temperature and pressure is normal as well as gum soreness. However, these issues will disappear after you have the permanent crown placed. Additionally, you’ll want to keep up with your regular oral care routine, especially since acrylic temporary crowns attract more bacterial plaque to teeth. When flossing, pull the floss out from the side and not up to avoid accidentally loosening or dislodging the temporary crown. If your temporary crown comes off, attempt to place it back on and call the dentist’s office. Let them know you need your temporary crown re-cemented. In the meantime, purchase dental cement from any pharmacy or grocery store for additional adhesion. You can also rinse your mouth out with antibacterial mouthwash or a saltwater mixture to reduce any inflammation present. If you have chronic pain stemming from the temporary crown or a bite that feels uneven, contact the dentist as soon as possible. 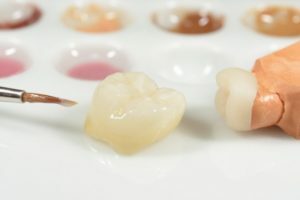 Maintaining a temporary crown is easy and permanent crowns don’t take long to create. Schedule an appointment with a dentist in Sunnyvale today if you’re experiencing problems with your crown! Dr. George T. Philip earned his DMD degree from the Nova Southeastern University College of Dental Medicine. He’s more than happy to answer any questions you have about temporary crowns and how to maintain them until you come back for your follow-up visit. To learn more about his practice or the dental crowns he offers, you can contact him through his website.